If you haven’t heard of the escape room craze that’s seeing pop ups in locales all over the country, you are missing out. Escape rooms are a real-life strategy game in which you and a few friends try to solve a set of mental puzzles to unlock the door of the room in which you are trapped- all before a predetermined time runs out. The only problem with escape rooms is you have to travel to take part in the experience. The folks over at ThinkFun have come up with a solution by bringing the escape room experience to your home. 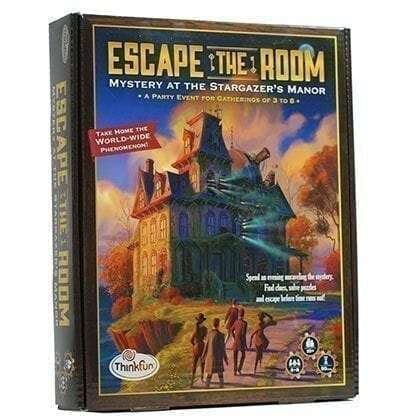 “Escape the Room: Mystery at Stargazers Manor” is an escape room in a box that allows you to play anywhere. The game has a rich story line that takes players on a wild ride. You and your friends will play as a group of concerned friends and neighbors who decide to check on a reclusive astronomer in his decrepit mansion. Throughout the journey you will be required to discover clues and solve puzzles before the time runs out. Teams of 3-5 players will have 2 hours and teams of 6 or more have 1.5 hours to complete all the puzzles and unlock the door. The game is for ages 10 and up but don’t let that discourage you if you are far older. The game is fun for all ages and will not disappoint whether you are 13 or 30. Previous article What Exactly Does “Activating Purpose" Mean in Sustainability?